4.7/5 out of 583 votes. Citrine is a yellow to golden member of the quartz mineral group. A deep golden variety from Madiera Spain can resemble the costly imperial topaz gem stone, which is one reason that citrine is a popular birthstone alternative to those born in November. 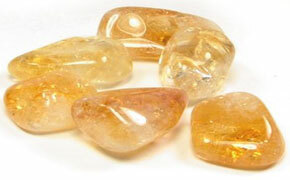 Citrine is known as the lucky "Merchants Stone". If you are in any type of sales, just put a citrine in the cash drawer and watch what happens. - Protect from the negative energy from someone else's abuse. - Open the mind to new thoughts. - Promote clarity of thought. Sources of citrine include Brazil, Bolivia, several African countries and parts of the Rusia.